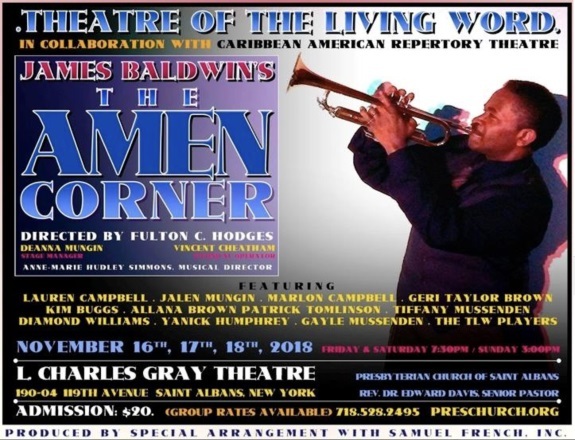 Theatre of the Living Word in collaboration with the Caribbean American Repertory Theater are pleased to present James Baldsin’s “The Amen Corner”. Directed by Fulton C. Hodges. Music Direction by Anne-Marie Hudley Simmons. The Amen Corner is a three-act play by James Baldwin. It was Baldwin’s first attempt at theater following Go Tell It on the Mountain. It was first published in 1954, and inspired a short-lived 1983 Broadway musical adaptation with the slightly truncated title, Amen Corner. The Amen Corner takes place in two settings: a ‘‘corner’’ church in Harlem and the apartment dwelling of Margaret Alexander, the church pastor, and of her son, David, and sister Odessa. After giving a fiery Sunday morning sermon, Margaret is confronted by the unexpected arrival of her long estranged husband, Luke, who collapses from illness shortly thereafter. Their son, David, along with several elders of the congregation, learn from Luke that, while Margaret had led everyone to believe that he had abandoned her with their son years ago, it was in fact Margaret who had left a dysfunctional Luke and pursued a religious life. This information precipitates confrontations between Margaret and her son, her congregation, and her estranged husband, regarding what they perceive as the hypocritical nature of her religious convictions, and the breakup of her family. Group rates available by visiting preschurch.org or by calling (718) 528-2495. Labels: It was Baldwin’s first attempt at theater following Go Tell It on the Mountain.